Below is a list of the current locations in Florida that are having National Drive Electric Events next month. We encourage you to participate in or attend nearby events. A club member has found the location of the "Coming Soon" "Miami" Service Center. It is located at 3851 Bird Road, Coral Gables, at the corner of Bird Road and 38th Ct. It will be located in a development that also houses the Gables Auto Vault. Another club member has been informed that Tesla will have the first two floors for service needs and possibly the third floor for vehicle storage. On July 21, 2018 we were pleased to host Javier Verdura, Director, Product Design at Tesla. 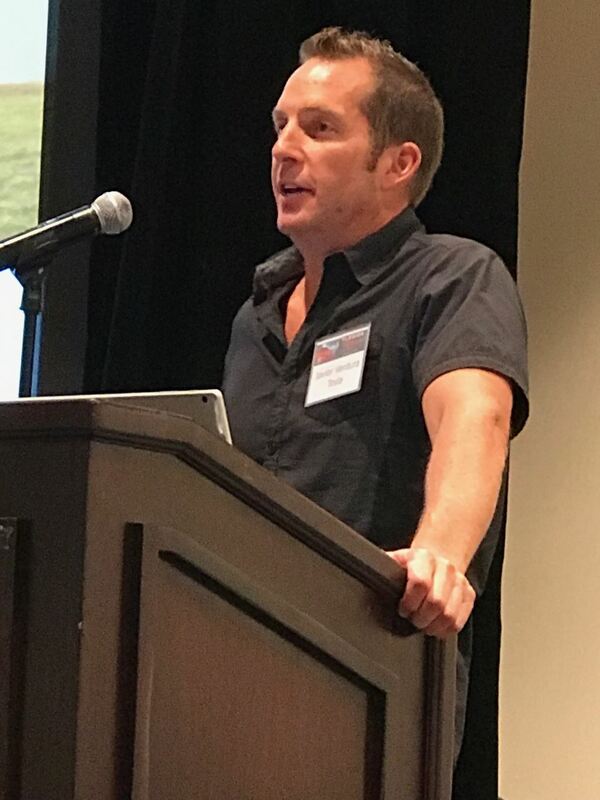 He provided an informative presentation on Tesla, the future of energy and mobility and covered a wide gamut of Tesla topics, as well as responding to a number of questions. 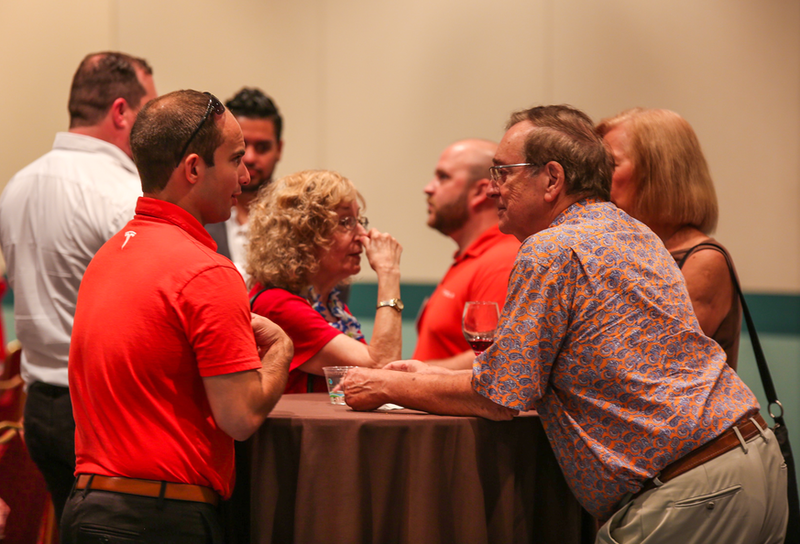 The event took place at the conference center at the beautiful Loews Royal Pacific Resort at Universal Orlando. 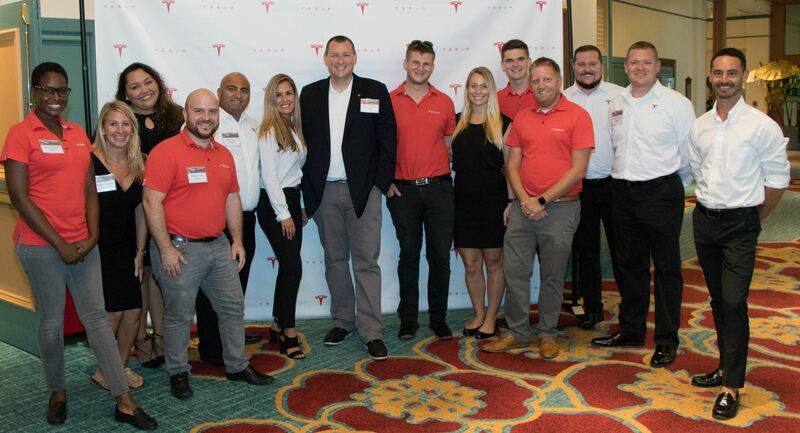 This event had the highest attendance of any event in the club’s more than 5-year history with about 130 members, guests and Tesla representatives in attendance. Admission was free. 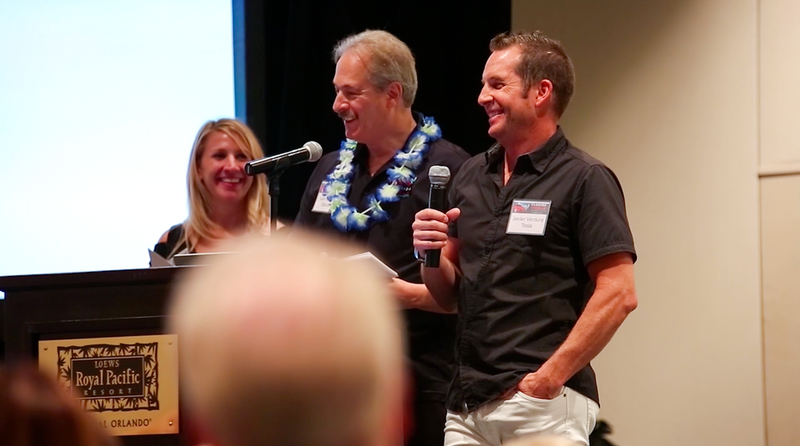 We had about 130 members, guests and Tesla representatives in attendance. For those wishing to spend the night or the weekend at Universal, we arranged for group rates at both Loews Royal Pacific and Loews Sapphire Falls Resorts, both on Universal grounds and walking distance from the conference center. Hosting a Tesla executive is a very exciting and long-awaited club event. This type of event ranked number one on our Event Preference Survey. We were particularly fortunate and appreciative to have someone with Javier’s stature to fly out here from California to spend time with us. Javier belongs to the inner circle of the elite design team at Tesla and meets regularly with Elon Musk to brief him on design developments. He reports directly to Franz von Holzhausen, Tesla’s Chief Designer. In his career of over 25 years, Javier has been recognized by winning the design industry’s most prestigious awards and his name appears on more than 130 patents. Since joining Tesla, he has been involved in a variety of projects, from vehicle components, to the design of the Superchargers, and most recently he’s led the design of Tesla’s ground breaking Solar Roof and Powerwall. Following Javier’s informative presentation, Jillian Percella, Tesla’s regional Marketing Manager, and I read some questions forwarded in advance for Javier and he took additional questions from the audience. After the Q&A session we had an informal Club Chat with Tesla. During the chat we had club member experts along with Tesla representatives taking questions. To lubricate the chat, we had a free beer and wine bar during this segment of the program. Participating in the chat was club member Matt Pressman. Matt is co-founder and president of EVANNEX, a family business specializing in aftermarket Tesla accessories. Matt is a prolific reporter of Tesla news and writes for Teslarati, CleanTechnica and InsideEVs. You can follow his work on the EVANNEX Blog. Club member Nick Howe was also on the Chat. Nick is the Vice President, of Florida Tesla Enthusiasts. He is the author of “Owning Model S”, and is well known in the Tesla community. Nick produces the popular “News from the Frunk” YouTube video channel which has over 3500 subscribers. The cocktail reception facilitated informal chats between Tesla representative and club members. Club members Nick Howe & Matt Pressman, along with Tesla reps Gus Cobeaga and Eric Fields chat with attendees. Javier Vendura, on left, chats with attendees during the cocktail reception. Tesla sent a large contingent of representatives to assist. Here are most of them. 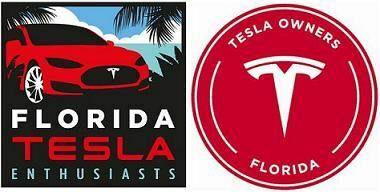 Participating from Tesla on the Chat were Bill Madden, District General Manager, North Florida, Gus Cobeaga, Regional Service Manager, Florida, and Eric Fields, Store Manager – Tesla Orlando. Go here to vote on favorite video by Liking it. One of our club members just spied out the "Coming Soon" Supercharger location listed on Tesla's Find Us page as "St. Petersburg". It's actually located at the Wawa gas station at 3101 Gandy Blvd, Pinellas Park. It will have 8 charging stalls. Here's a recent drone photo taken by one of our members. 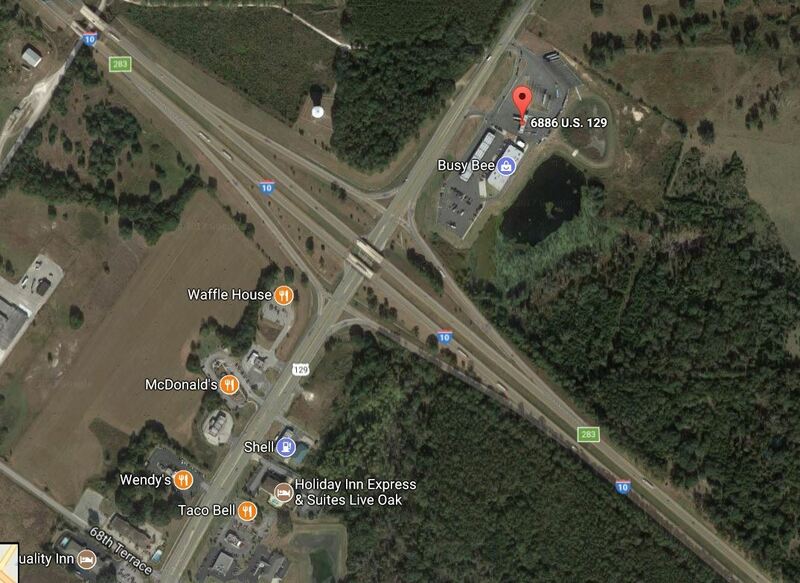 This Supercharger location is operational and its location has been uploaded to the Tesla fleet's navigation systems. So we need to locate the remaining 10 Supercharger Stations that Tesla hopes to construct by year-end. Please keep a look-out and let me know at lfchanin@gmail.com if you think you have a location. 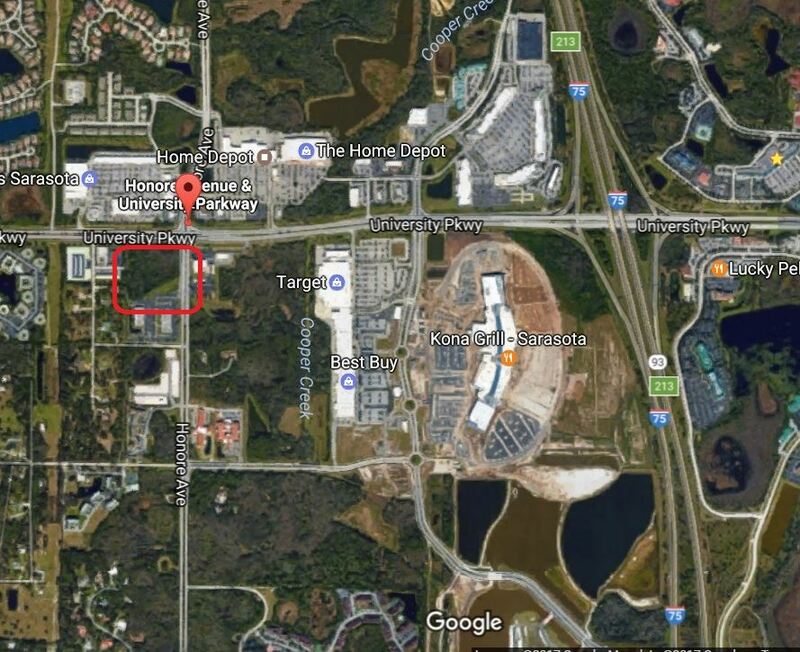 Earlier I received a credible rumor regarding the location of the Supercharger Station coming to Sarasota. My source believed that the station would be located at a Whole Foods Market in Sarasota. There currently is a Whole Foods in downtown Sarasota, but that would not be an ideal location. 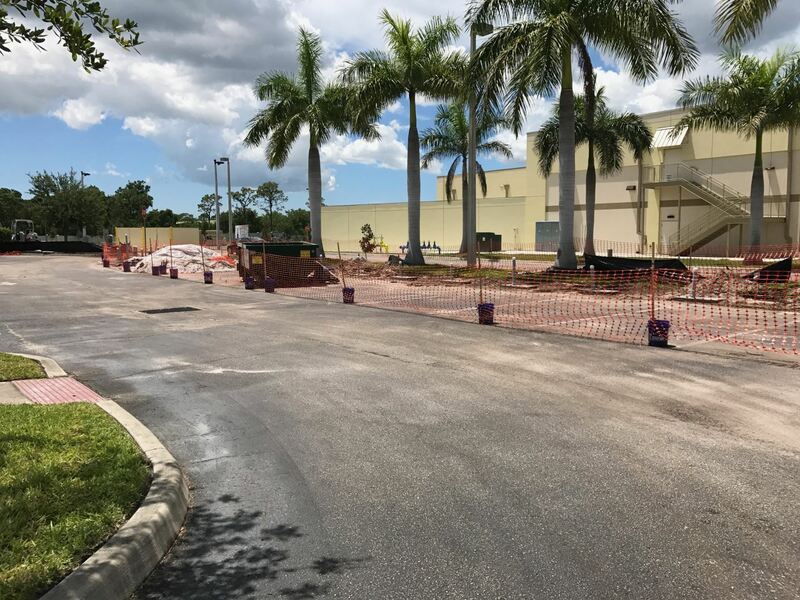 However, Whole Foods is currently building a large 40,000 square foot anchor store at University Station which will be located at the southwest corner of University Parkway and Honore Avenue in Sarasota. This development is expected to be completed in the fourth quarter of this year which is consistent with Tesla's information on their Find Us page. 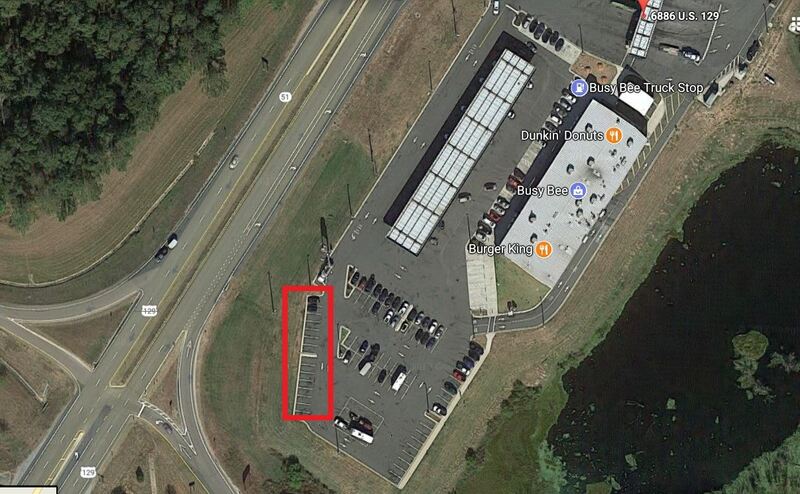 This is located nearby University Town Center Mall (utc) and is a good location for a Supercharger Station once the major road construction is completed to facilitate access to this area. I asked the University Station Facebook page folks whether they could confirm that they would be hosting a Tesla Supercharger there. I received an interesting response. They didn't ask me what a Supercharger was, nor did they deny it was going in there. Here's their response. 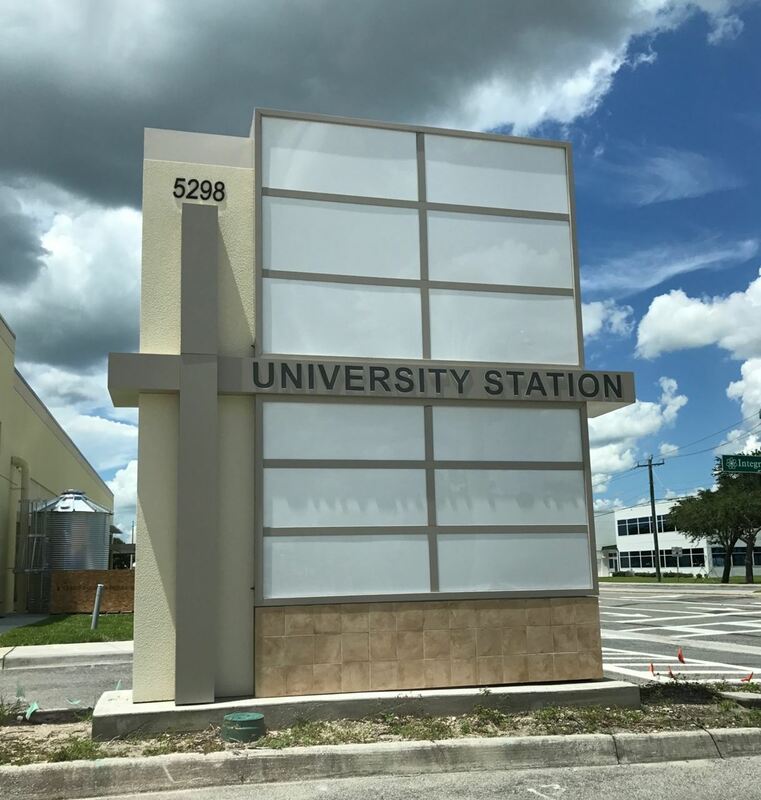 "University Station - Sarasota We cannot confirm that but stay tuned to our page for updates." Here's a vicinity map of the location of University Station. 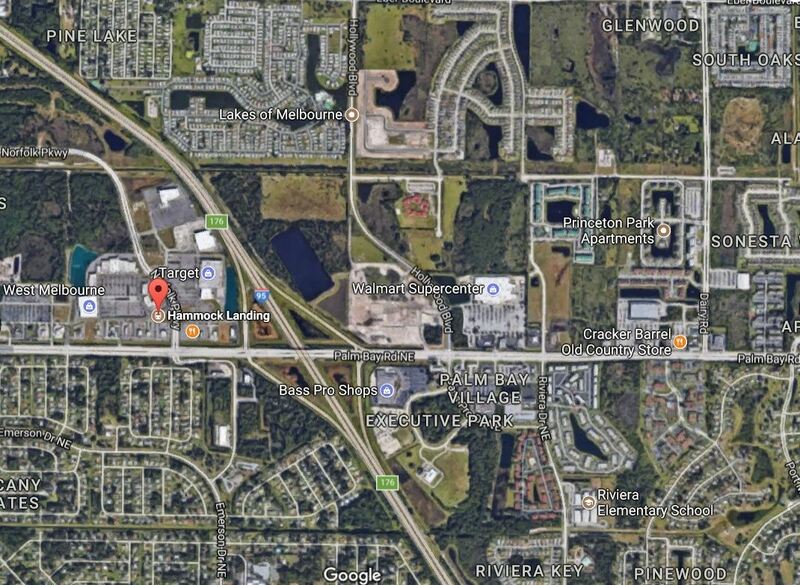 You can see how close it is to UTC mall (see Kona Grill) and I-75. Well, today a member at Tesla Motors Club confirmed that the Supercharger Station is indeed being constructed in back of the Whole Foods and it will have 20 charging stalls. Update: The Sarasota Supercharger Station is now operational! 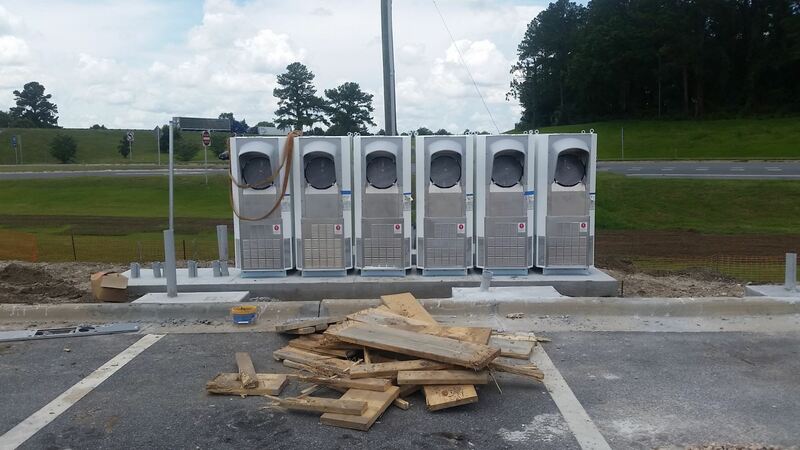 Looks like the "Coming Soon" Supercharger Station in Live Oak is well underway at the intersection of I-10 and 129. At the Busy Bee Truck Stop at 6886 US-129. The station will have 12 charging stalls. UPDATE: This location is now operational. The Hammock Landing shopping center, located west of Interstate 95 on the north side of Palm Bay Road, will play host to the station, according to West Melbourne City Manager Scott Morgan. 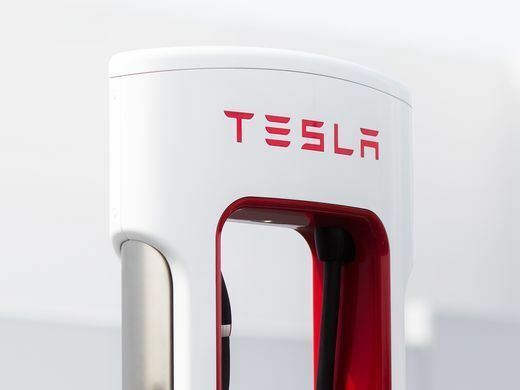 He said the city's planning department confirmed that Tesla submitted applications for installing the Supercharger within Hammock Landing west of Norfolk Parkway. 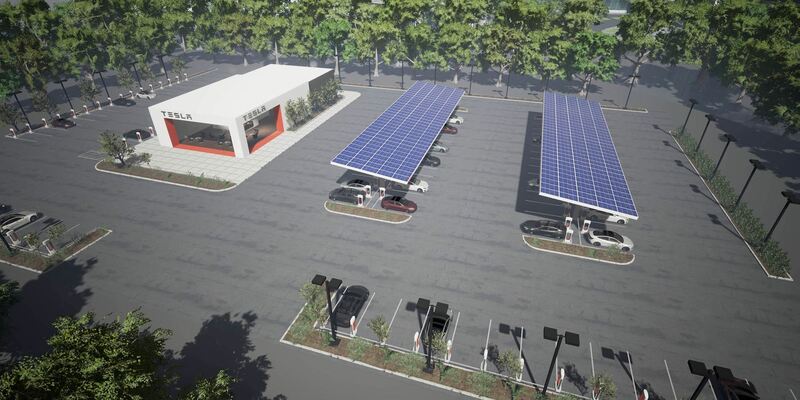 Tesla hopes to open the Supercharger, which will feature multiple charging units, by the end of this year, according to the company's website. Today Tesla discussed their plans to expand the Supercharger Network in an article entitled Charging Is Our Priority. They also updated their interactive "Coming Soon" Map of Superchargers and we received some exciting news. The map shows that in addition to our existing 15 operational Supercharger Stations in Florida, that they have plans to add 15 more stations. Although we don't have official word, some of the new stations are likely to be expansions of existing stations. Here, in no particular order, is the list of new Supercharger Stations planned for 2017. 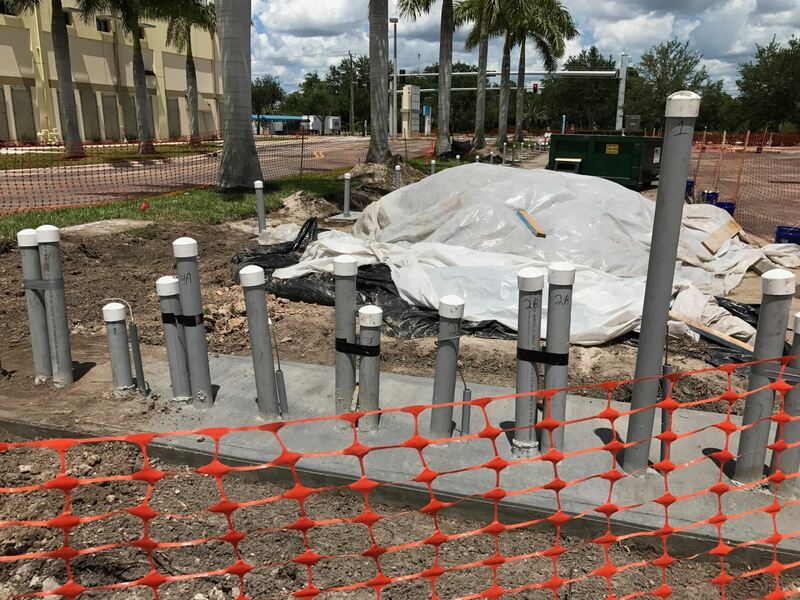 You will notice that Tesla has finally updated the map and the navigation systems of the Tesla fleet with the information regarding the new Naples Supercharger Station.